Posted on 4, September 2018 by EuropaWire PR Editors | This entry was posted in Aviation & Aerospace, France, Technology, Transportation & Logistics and tagged Airbus, aircrafts, airlines, Aviation, open data platform, open_data, operational_data, predictive_maintenance, Skywise. Bookmark the permalink. TOULOUSE, 04-Sep-2018 — /EuropaWire/ — In less than three years’ time, Skywise has evolved from a promising concept to the aviation sector’s most robust data asset, with more than 6,000 users around the world now benefitting from this innovative, Airbus-developed platform on a weekly basis. Skywise – which provides a single access point for the sharing of operational and flight data – is about making the right information available at the right time. To do so, it leverages the massive amount of data previously locked in company and functional silos across the industry to improve operational performance and business results for aircraft operators, suppliers and Airbus itself, as well as support digital transformation efforts. By adopting Skywise, customers benefit from a supercharged and ever-evolving digital platform. The main outcome is efficiencies, savings and revenue opportunities achieved by reducing operational interruptions, anticipating and optimising maintenance, burning less fuel, operating more efficiently, reducing workload and leaving room for third-party services. Despite the fast growth and progress so far, the Skywise story is only just beginning. To maximise the value created on an industry-wide basis, Airbus will continue to grow it as a true ecosystem – bringing together many more companies and stakeholders around the shared goal of more efficient, greener and more comfortable air transportation. Airbus launched Skywise as an open data platform for the aviation industry at the 2017 Paris Air Show, with several different products available to meet various needs and address specific groups of users. Skywise Core is the backbone of the entire Skywise infrastructure. It is a platform that integrates and processes data coming from Airbus’ own aircraft, as well as operational data from participating airlines. Airbus offers Skywise Core on a “shared value” business model: airlines use it at no cost in exchange for sharing operational data about their Airbus aircraft with the manufacturer. It’s a win-win scenario for both sides: airlines get access to a valuable platform to help them improve their own productivity, while Airbus gets access to valuable operational data. 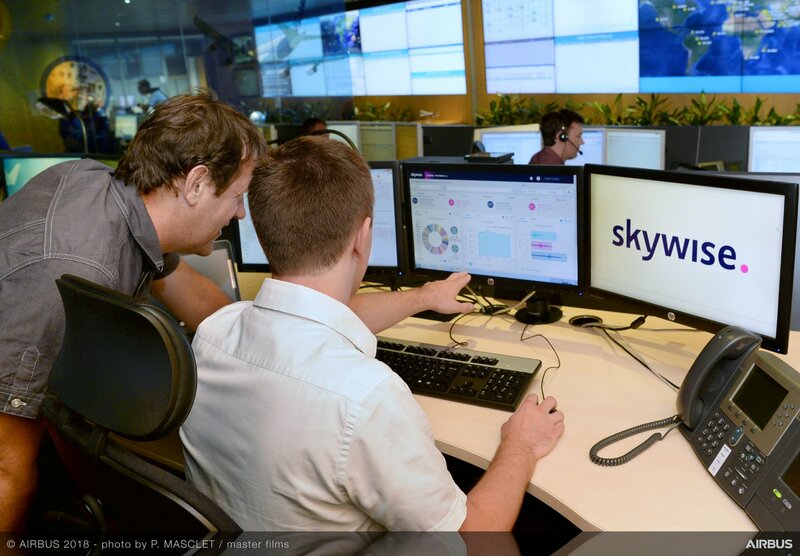 Other offerings include Skywise Digital Services, which leverage Airbus expertise to address common issues across airlines, with applications that include predictive maintenance, reliability and health monitoring; while Skywise Connect allows Airbus to get the most data in the best possible way from each and every one of its aircraft. Over 40 different projects across Airbus sites and functions are running on Skywise. These applications support data-driven decision-making by providing contextual data to the right people at the right time. And because the Skywise platform allows for easy re-use of data and algorithms, project teams can get started and deploy applications in a matter of weeks in some cases. In a bid to work towards ever greater customer satisfaction and competitiveness, Airbus Helicopters initiated its first Skywise plateau in June 2018. It will support employees and customers by simplifying access to Airbus Helicopters’ relevant data and helping to accelerate data processing. The platform also is being used to measure progress on production and/or sales campaigns, as well as to diagnose and establish meaningful forecasts. Additionally, the retrofit of the industrial chain with harmonized and connected next-generation tools will allow Airbus to feed better quality data into Skywise, amplifying its benefits. Airbus announced it was extending Skywise to the supply chain in July 2018, enabling unprecedented improvements in the reliability, quality and performance of suppliers. Since late last year, the company has been working with selected suppliers during an early adopter phase to evaluate features and functionalities. Multiple ‘early adopter’ suppliers are working with Airbus to test and help mature the new supplier-related components of Skywise. These participants represent a very broad spectrum of specialties, including cabin, propulsion, aerostructures, materials and equipment/systems.